The primary case in my PhD project is a course in the Masterprogramme in ICT and Learning (MIL), which I have redesigned and run three times so far. Though the course has been quite different from research cycle to research cycle, there are still some common traits. The course is the first part of a module on ICT and Didactic Design and according to the curriculum the course should focus on theory and analysis, whereas the second course in the module should focus on concept and implementation. Though separate, the two courses should be regarded as connected, in the sense that the learning outcome of the first course should be more or less applied in the second course. In the first course the students usually are provided with 2-3 optional virtual teaching and learning environments between which they are asked to choose one as analytical object. 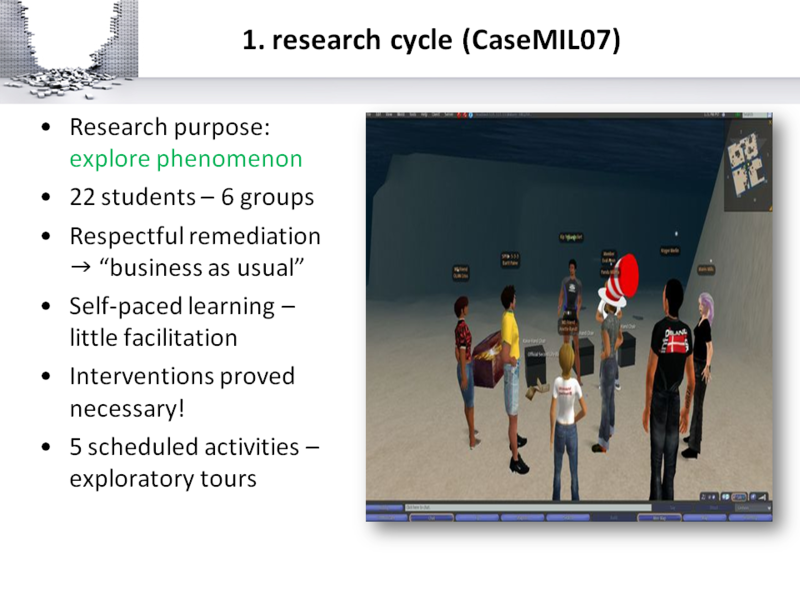 Throughout the MIL programme the students are introduced to different virtual teaching and learning environments covering a wide range of mainly conventional 2D asynchronous and synchronous examples. Therefore the environments chosen for this course always represent the more unconventional trends, since it is our experience that these often provide more rich and radical settings, which can stimulate reflections. For the last three years the students have been able to choose between the 3D virtual game, Global Conflicts or the 3D virtual world, Second Life as their analytical object. Regardless of choice, the students are expected to discuss and analyze the teaching and learning environment on the basis of the 5 following mandatory topics; Didactics and target groups, Orientation and navigation, Interaction, Learning processes and Audio-visuals. The goal of the course is to teach the students to analyze and reflect based on theoretical foundations – not to teach them about the analytical objects per se. Officially the course runs for 6 weeks from November 1st – until approx. December 15th. However, the first two weeks are regarded as preparation period, the students finish the previous module in this period, so they are mainly expected to prepare by reading and the period ends with a 2 ½ day f2f seminar where we introduce the upcoming module. Regardless of the fact that I ran the first in-world course in the fall 2007 before I started on my PhD project (January ’08), that pilot course provided valuable data and I consider it to be the first research cycle. 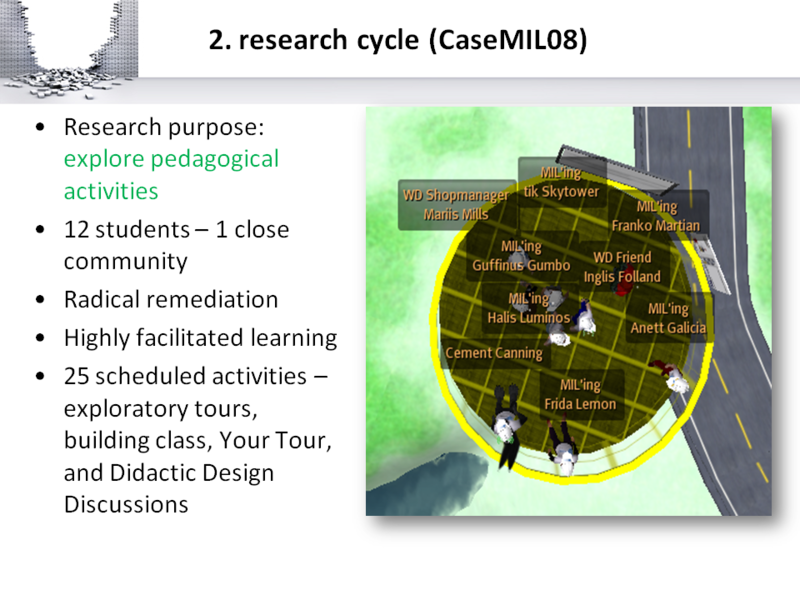 The main research purpose of this first research cycle was to explore SL as medium and quite deliberately I chose not to change the existing course design, which meant that by and large the students were expected to explore the environment by themselves with very little teacher facilitation. Even though MIL students are used to self paced learning and in general can be regarded as being quite tech-savvy SL turned out to be too complex and too unfamiliar for this strategy and interventions proved necessary. I arranged 5 optional activities where we explored different educational designs, met some of my in-world colleagues and engaged in didactic discussions. Since these activities were optional only about half of the students participated, but it resulted in a strong community feeling among those who did. Based on the findings from this research cycle and in particular the ongoing feedback from the students I decided to focus on different pedagogical in-world activities and a different overall organization in the second research cycle. 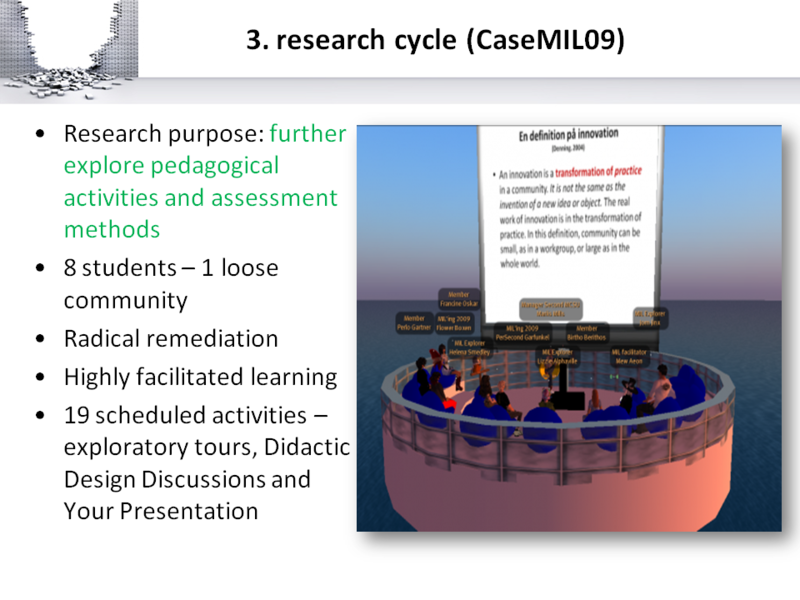 In the first research cycle the students chose to work in their regular study groups meaning that these groups would continue in the second course of the module and the design of the asynchronous environment supported this organization. In the second research cycle the students chose more based on their individual interests and since there were significantly less students, I encouraged them to act like one large group or community and changed the design of the asynchronous environment accordingly (for an elaboration on the asynchronous environment have a look at this post). The emphasis on different activities proved valuable and especially the preliminary meetings focusing on learning basic SL skills, the Didactic Design Discussions and the students’ own tours seemed worth preserving. Even though the students did a great job in the first research cycle, the quality of the student analysis and reflections in the second research cycle clearly showed a better understanding of the medium and the relation between theory and practice became more nuanced and critical. The activity of the students in the second cycle rose to an unprecedented level (also compared to other MIL courses) and in general the changes in the didactic design seemed to be successful when judging their learning outcome. Still, the downside was that we were all exhausted afterwards and the activity level just did not seem realistic to keep up in a forthcoming course. Once again the students provided valuable feedback on the course and they pointed to one very important issue that in their opinion needed to be changed; the assessment method. In these two research cycles I had maintained the assessment method (write a min. of 3 posts in the asynchronous environment) as stated in the curriculum – above all because I believe asynchronous reflection and writing in general to be one of the greatest learning activities, but also because I didn’t want the choice between the two analytical objects to be based on a difference in this. Furthermore the students at MIL are accustomed to working asynchronously for the main part as it is considered to provide the most flexibility, which naturally is very important when you deal with adults in further education. I asked the students in the first cycle if they would have been willing to do some sort of in-world activity instead of writing posts, but they were reluctant. In hindsight, I think the reluctance was closely connected to the little facilitation and the task of doing something in-world probably seemed overwhelming, whereas the students in the second cycle attained a more profound knowledge of the medium itself. As a result of these considerations, I decided to experiment with the assessment method and some of the other pedagogical activities in the third research cycle. In the second research cycle all scheduled activities were optional except one (of their own choice). In the third cycle I chose to make two in-world activities (one “Newbie Night” and one Didactic Design Discussion – again of their own choice) mandatory. In between the 2nd and the 3rd research cycle I ran another in-world course (in another setting than MIL) and based on that experience, I decided that learning the basic skills should be mandatory and teacher facilitated. In the second cycle the Didactic Design Discussions proved valuable not least in showing how teaching and learning actually can happen in-world, and I wanted to make sure that all students experienced what it was like to participate in activities like this. And then I also decided to give the students the opportunity to do a synchronous in-world presentation of their analysis and reflections on SL as teaching and learning environment instead of doing it asynchronously. In my experience there are always a few students who struggle very hard with SL (for various reasons – but some due to technical difficulties alone), and I didn’t want to inflict extra pressure on these students, so I chose to make the assessment method optional. 7 out of 8 students chose to do their presentation in-world. Unfortunately one of the students gave up on doing her presentation in-world because her set-up was removed shortly before she was scheduled to present and she ended up doing it asynchronously, but besides this the in-world presentation idea seemed successful. I’ve covered these presentations in the following four posts (part 1, part 2, part 3 and part 4), and the learning outcome was definitely high both theoretically and practically. Obviously the experience of being in charge of an in-world session (all presentations included learning activities) gave the students some important knowledge on the teaching and learning potential of the medium. Looking back all three courses have been successful in the sense that the students undoubtedly have learned a lot, but there is an unsolved discrepancy between the huge amount of time both the students and I have been spending and the flexibility that is needed in an educational setting like this. MIL students are used to a workload of 15-20 hrs. pr. week, but in general they control and manage this time on their own, and this changes noticeably when you choose to remediate the majority of the activities into a complex, synchronous medium like SL. And so I’m wondering; is it worth it? Does it make sense to use SL given these particular circumstances (4 effective weeks, a curriculum other than the medium itself, full time employed students and recurring technical challenges)? I honestly can’t say for the time being.